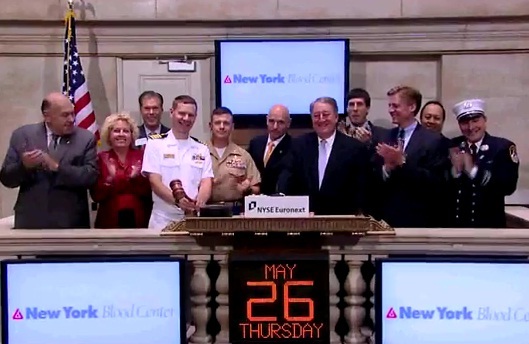 Also at the bell podium were Dr. Christopher Hillyer, New York Blood Center President and CEO; New York Fire Commissioner Salvatore J. Cassano; and members of the U.S. armed forces. The Military Community Blood Program allowed New Yorkers to join sailors and Marines in donating blood aboard the U.S.S. Iwo Jima and at the U.S. Navy’s Stapleton Homeport on Staten Island during Fleet Week New York City 2011. Each donor received a specially minted commemorative New York Blood Center military donor challenge coin to recognize their giving alongside the brave members of the U.S. armed forces.